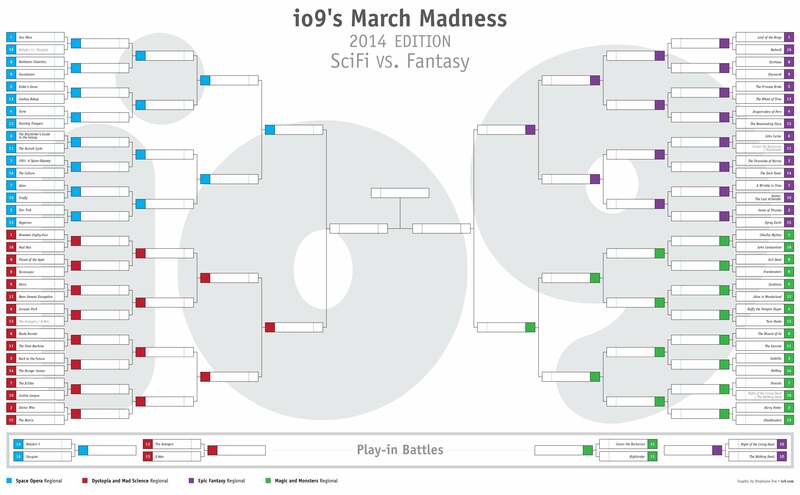 io9's March Madness: Science Fiction vs. Fantasy! Are you ready for another edition of io9's March Madness? In previous years, we've crowned the best movie, the worst movie, and the best TV show. But this year, we're going bigger. 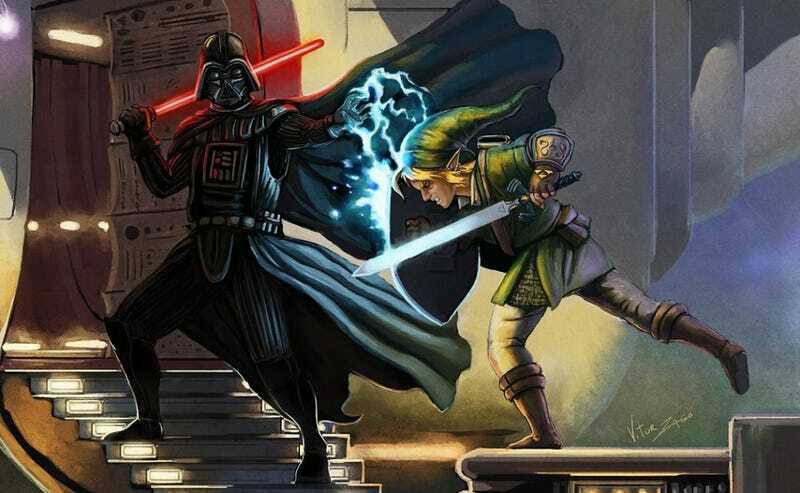 The most famous series in science fiction and fantasy will battle it out, to see which genre reigns supreme! Check out our full bracket, and vote right now on our four opening-round battles! Over the past several days, the io9 selection committee reconvened to figure out how we could possibly boil all of science fiction and fantasy – including movies, TV shows, books, and comics – into just 64 competitors. Ultimately, we couldn't do it, which is why we're taking another leaf out of the NCAA's book by expanding our tournament to 68 entrants. That means that we have four play-in battles today, as you pick which of these genre heavyweights – Babylon 5 vs. Stargate, the Avengers vs. the X-Men, Conan the Barbarian vs. the Highlander series, and Night of the Living Dead vs. The Walking Dead – make the final 64. You can skip to the bottom to VOTE NOW, or you can keep reading for our explanation of how we created the bracket. As for the bracket itself, you can click on it to expand, or click here to zoom in on a really big version. As you can probably tell from the quality of the franchises that are facing off in this mini-opening round, the competition was fierce just to make it into this tournament, and there's no doubt that we left out some very worthy science fiction and fantasy classics. Every version of a story counts… unless you don't want it to. When we make Lord of the Rings the 1-seed in the Epic Fantasy Regional, we're talking about all of J.R.R. Tolkien's Middle Earth books – including The Hobbit and even The Silmarillion, if you're feel frisky – as well as all of Peter Jackson's adaptations; hell, you can throw in the Ralph Bashki or Rankin/Bass animated versions, if you want. Ah, but what if you love Tolkien's books but can't stand Jackson's movies? Should you vote for the version you do like or vote against the version you dislike? Well, that's entirely up to you! Our competitors are loosely organized into four themed regionals – emphasis on "loosely." The science fiction franchises are on the left of the bracket, while the fantasy franchises are on the right. We created four basic categories to organize our competitors: Space Opera, Dystopia and Mad Science, Epic Fantasy, and Magic and Monsters. These are not meant to be definitive categories – if absolutely nothing else, we're sure as hell not making a final statement on whether Star Wars is science fiction or fantasy. This is a rough attempt to make sure that similar franchises are matched up against each other in the early going and ensure we have some variety as we reach the end of the tournament. It's time for you to decide! Polls will be open until midnight Pacific Time tonight! And come back this Friday for the first half of the round of 64! And once again, CLICK HERE for the full-size version of the bracket.